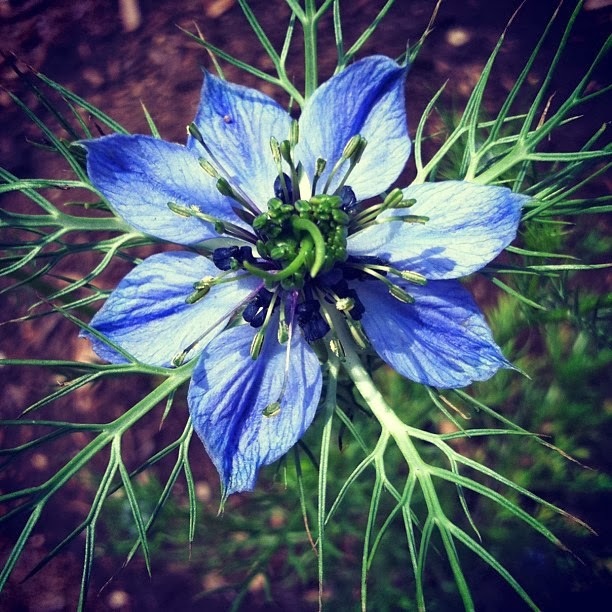 I met Love-in-a-mist, Nigella damascena, an annual flowering plant in the Ranunculaceae family that originates from Southern Europe, North Africa and Southeast Asia, a few years ago. It was the 'free pack' of seeds I received with a larger seed order from Baker Creek Heirloom. I scattered the seeds in one of our raised beds and forgot about them until the following year when they decided to sprout on their own. The flower itself is gorgeous and once established it didn’t need much water. Which seemed to be the case for many after reading the reviews on Baker Creek's website. When found in its native habit it grows in neglected soil. 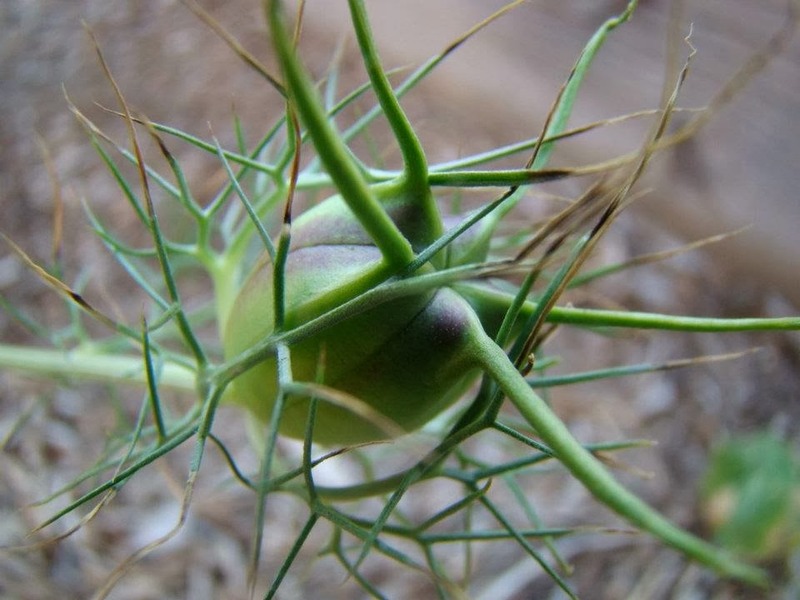 I've seen folks go back and forth on whether or not the seeds of this particular variety are edible, but Nigella sativa, damascena's cousin in the one that has edible healing seeds known as black cumin. Nigella damascena's cousin Nigella sativa, I discovered when trying to ID the two, has great healing properties found in its seed that date back centuries! First recorded use dates back to the Egyptians and it's known as the 'Seed of Blessing' in Arabic cultures. Black cumin which is Nigella Sativa's seeds, produces secretion of insulin from the pancreas and helps balance out the sensitivity of insulin in skeletal muscles, liver cells and also increases glucose uptake by muscular tissues. The phytonutrient, thymoquinone is the key factor in black cumin’s glucose-lowering effect. This is just one of many healing actions. Black cumin has a much more subtle flavor than brown cumin. It carries a fennel aroma and sweeter caraway flavor. Black cumin is used in Northern Indian, North African and the Middle Eastern dishes. It's often added to chutneys, curries, meat dishes, rice dishes, breads, and yogurt to give you an idea of how to incorporate it into your diet. And now back to Nigella damascena. She was slow to start but proved to be resilient with little to no water. Her flowers will stop you in your tracks but pollinators don't seem to care much for her. I have seen a few parasitic wasps hanging around her petals. The dried flower pods are so very pretty and look darling in bouquets are as decor. I used some of mine as gift-wrapping decor. Of course I would decorate with plants! You can purchase Nigella damascena seeds through Baker Creek, here. You can purchase Nigella sativa seeds through Horizon Herbs, here.